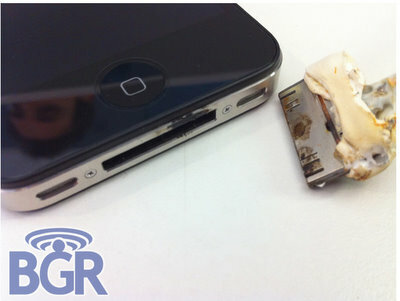 BGR is reporting that an iPhone 4 user has recently had their iPhone burst into flames and actually burned their hand. The iPhone 4 caught on fire due to the USB cord provided by Apple, not directly from the iPhone 4 itself. Regardless of what the cause of the iPhone 4 bursting into flames, the story is now spreading across the web and bringing more negative attention to Apple, Steve Jobs, and the iPhone 4. There are groups of people who are growing so disgruntled with the iPhone 4 that they are actually starting a petition. Specifically, the petition is to try to get Apple to fix the issue of the iPhone 4 losing it’s signal as the device is held by the side metal bands.